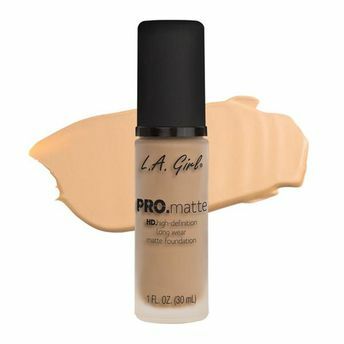 With a soft and suede-like finish, the L.A Girl Pro Color & Pro Matte Foundation will have you covered and shine-free all day. Its creamy, liquid formula provides smooth and buildable coverage for both day and night time wear. Minimize the appearance of pores and fine lines for an even, soft-focus effect. This paraben-free formula is enriched with vitamin E, B5 & sunflower oil. About the Brand: L.A. GIRL Cosmetics is a renowned US based brand that focuses on meeting the beauty needs of every woman. They have a wide range of on-trend, innovative and high-quality products for makeup enthusiasts all across the world. With an amazing selection of high-quality color cosmetics for all makeup users - from the savvy beauty junkies to inspired novices, that cater to makeup enthusiasts all over the worl. L.A. Girl has become a destination brand that offers beauty without compromise A " Beauty for all! Alternatively, you can also find many more products from the L.A. Girl PRO Matte Foundation range.